First law. Time is the only mathematical translation made on Pi to a rational state. A circles proportional scale set to its own circumference by use of diameter is not possible. The state of proportion must be moved inside from outside boundary of circumference by use of motion and scale by calculation. As these two proportion share rationality within calculation as their principle. (12:60:60:12), (03:15:15:03), (048:240:240:048) = (60:12:12:60), (15:03:03:15), (240:048:048:240) whereas (12.0: 60.0: 60.0: 12.0) & (60.0: 12.0: 12.0: 60.0) set the variable in an absolute. The explanation to this math may be understood better as, when translating time to a square in geometry we create two squares of different size by use of distance apart. The larger square is the time closest to user the smaller square the time of greater distance away. Those two squares will then form a rectangle when a parallel line is held to the distance half way between both squares. Geometric Time in linear translation. How does someone mathematically recreate Pi using a square and not circle? Do you believe it can be done? How do you believe it can be done? In making a mathematic point. All circles have a point at their center that is a circle, the beginning of radius, the middle of diameter. All squares have a point at their center that is a circle, two independent diameters from two area, the center of all corners, the center of all sides. One point, one circle. The point of explanation and talk of grievance in mathematics is the credit for the removal of Pi constantly created inside the square as constant. Meaning it was never relative it was a mathmatic constant unless formulated otherwise as absolute by rule of algebra. Time as math process is not finished as the principle was started long before the complete specifications as requirement had been detailed by application of humanity. In geometry why time and space work for detailing mathematic position. Space is a geometric square and time is a geometric rectangle. 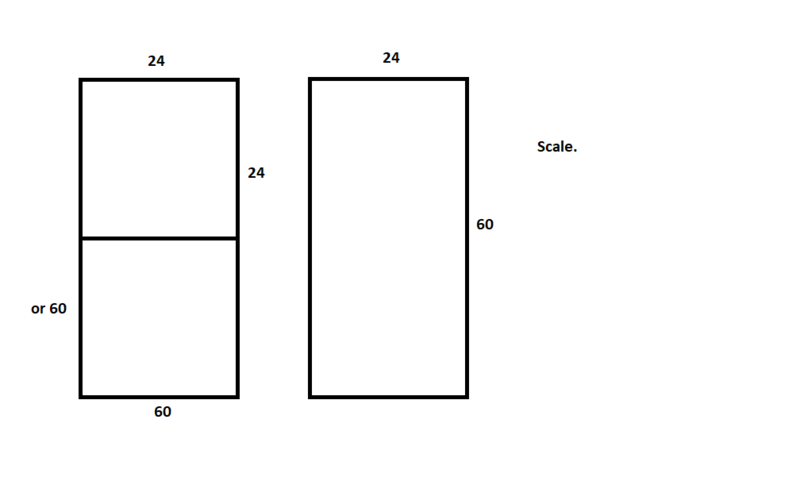 the rectangle can be scaled to become divisible by two of the square. The ratio of an igloo's circumference to its diameter is known as Eskimo Pi. Um? isn't it, wouldn't be, the Equator of the igloo's radius is known as Eskimo Pi? A fish, a seal, and a Eskimo had all met in the after life. What did the fish say to the seal? The circumference of a circle is equal to a ratio in a scaled circumference as distance from the diameter. A circumference is one number. a ratio is two numbers. "The circumference of a circle is equal to a ratio ..."
Yes, all circumference are equal to the diameter, by proportion, with other circles this in a sequence of scale. This is say that all circles are not relative simple because their own diameters are disproportionate as a common state. Other word Einstein needed to calibrate time to space in the universe before trying to make any calculations in the principle of time travel in the universe. There is no ratio on the number-line. How many hours in a day? How many minutes are in an hour? how many seconds in a minute? How many hours are in a Am? How many hours are in a PM? Brazilian, isn’t that what we get when we add alcohol, a foreign country, and secret service men then mix well ? Q: Why do engineers confuse Halloween and Christmas? A: Because Oct 31 equals Dec 25. A: Both holidays celebrate using the combination of green with red, and are full of monsters looking for treats. B: The engineer has not noticed that time is mathematically proportionate to a rectangle which can be scaled to the area of two equal squares. Meanwhile the calendar only holds the months Oct, & Dec. equal at 31 days, with the use of one direction motion and irrational numbers. C: October fest comes first and by the time the other two holidays roll around the majority is to drunk to know? C) I've been to Munich. I know. A) Halloween: orange & black. All Hollows Eve. Red blood, green goblins, and a happy Druid new year to you. Party starts October 31 and ends November 1. Don’t mind the spirits that are wondering the earth from the year that has past, and not consumed. Still no say on how the use of atomic, or the calendar year are calculated into a translation of geometry to be formulated into scale like time as we all may use it but not know it? Perhaps. But when I google images of Halloween most of the images I get are pumpkins, witches dressed in black, and black cats. The color green, if a tradition of Halloween decor at all, is recessive, in New York culture. I've lived on both sides of the Mason Dixie, and both sides of the Mississippi. But most of my Halloweens I spend in New York State. October 31, celebrated in the United States, Canada, and the British Isles by children going door to door while wearing costumes and begging treats and playing pranks. We still do not address the little monsters in the room. Evil or not, god or bad or not. The other little monster addressing the grievance of time. How does the atomic time, or calendar time set the creation of a geometric rectangle to be scaled with the understanding set by math for space as square? Does they do so, or are they just plagiarizing the math principle of time to take and ride on the credit for this process? The artificial Horizon in atomic time is not related to any artificial horizon earth. The direction of scale is in the opposite direction meaning any unseen error cannot be tested. The decimal point is an irrational addition to the ratio as it is changing the set scale between horizon and object of observation. Is INTERNATIONAL ATOMIC TIME different from GMT / Zulu? This mathematic translation takes place only in one direction so far. Uses the combined output of some 400 highly precise atomic clocks. It provided the exact speed at which the clock ticks. Universal Time also known as astronomical time, refers to the Earth’s rotation. It is used to compare the pace provided by International Atomic Time with the actual length of the day on earth. The link only worked for me out of MS Edge. Time sets a distance using motion. We know the earth rotates 360 degrees and North is 0 degrees. Atomic time is not setting a distance to be scaled up or down. It simply describes by suggestion the speed it creates is consistent, yet is never linked on earth by any scientific mathematic scale. Love to see the tweezers used to adjust the sextant for this project, ones that works on an atomic level that is. 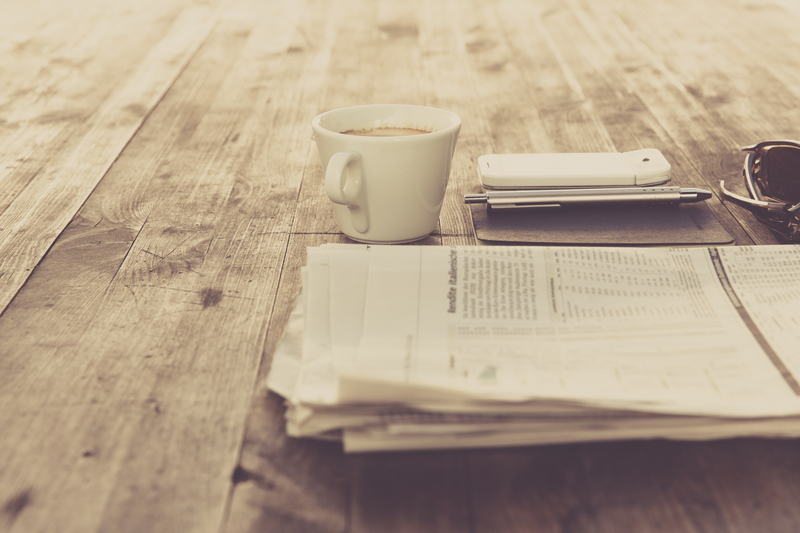 There may be a misinterpretation of scientific proof as a general need in this matter. Scale, motion, and velocity on principle of time directs a guideline that would have science looking for a connection with magmatic North and South Pole, on the atomic level with all particles. Constant of speed is negated in relationship to a separation process for geometry used by math for time translations and the atomic clock is set to its own horizon not earths. If the speed of the second relates to the distance of a second by proportion of degree, and the distance of the second is set by the horizon on earth being placed in line with an angle to object that is was believed to be moving around the earth. Now Earth’s rotation. The process gives us a circumference that is divided into degrees, hours, and minutes, seconds this circumference works alongside the compass which has a circumference that is divided by North, South, East, and West. 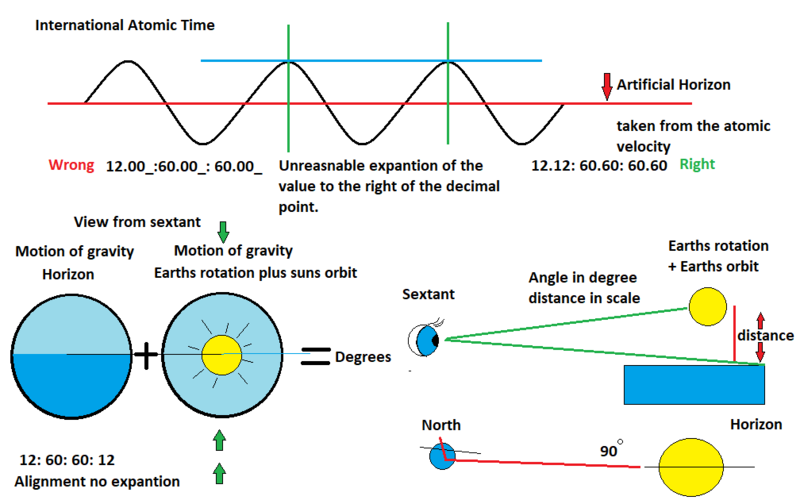 What has been aborted is the relationship between the measurement of distance on earth from East to West in its relationship to a compass heading described as North to South, this measurement also shares the use of degrees, hours, minutes, and seconds. Atomic second is a constant velocity but is not in scale to the earths circumference by its motion. It is raw and has not been mathematically synchronized. A law of Time suggests that an atomic second needs a form of compass for a creation of heading that is in a 90 degree angle to create a artificial horizon to which it can be linked to develop a scale of dimensional proportion. The Atomic Second is left unscaled to be proportionate to a measurement of time. 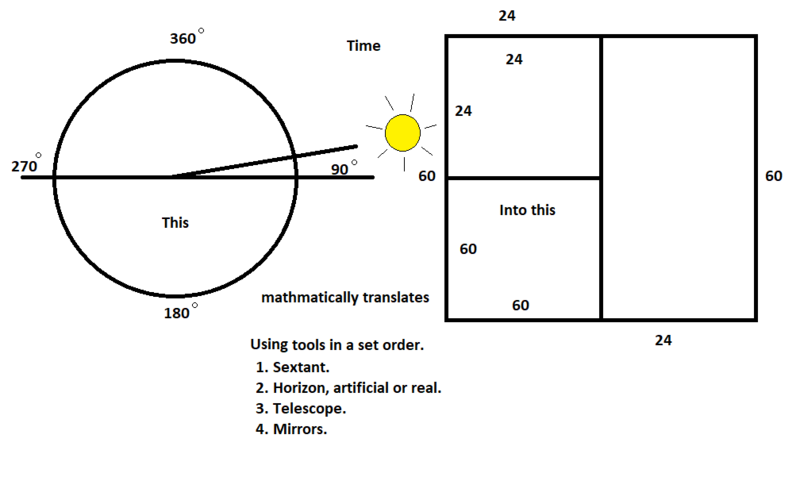 Just to point out that when looking through a sextant there are two circles of different scale that are placed in a line when directing the creation of time mathematically. the image to the left is just a small section of a rotating circle ( oval ). We raced to the moon in that race we did not need advanced forms of navigation for navigation in the universe. We can see the moon. Yes time exists it is a sequence of distance in geometry made on a basis of circle. A compass should point North, a time clock directs a point held 90 degrees up in the air, 12:00:00 noon form where you stand. The math process as a whole must be translated correctly so scale can remain consistent with velocity, set motion alone does not insure math translation to scale. Made by compass and Clock. I am going to rephrase that. A compass should point north. A clock should point 90 degrees from a level line that crosses that compass line north to south once a day. All clocks do not need to just one clock to which the others are calibrated to. This maintains the distance not speed of time.